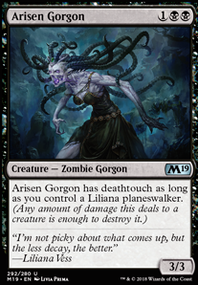 Considering the Gorgon Tribal Commander is Hythonia the Cruel , yeah, it's a weak tribe. 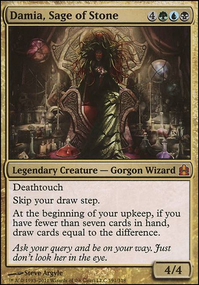 : Create a 2/4 Gorgon creature token with deathtouch. 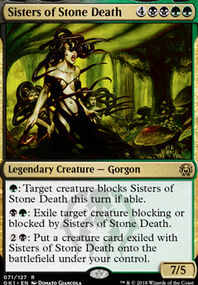 Sisters of the Stone Death was the original legend. 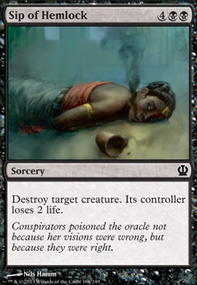 Let's see another (mostly) unusued tribal commander! 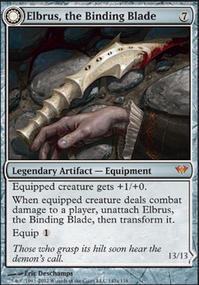 Blade of the Bloodchief - I feel as though it's not gonna be used to its full potential most of the time, since, while Vish Kal likes counters, this deck isn't a counter deck that much. Walking Ballista - Maybe, but I have reservations about adding it since I can't really see myself ever using the ability to gain more counters, so it'd enter with x counters and id either sac it to Vish, or use it all up to blast someone. Kalitas, Traitor of Ghet - Already in. 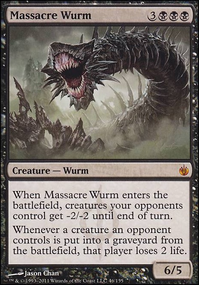 Maga, Traitor to Mortals - Would be way to expensive to cast to get a significant amount of life drained, can only see him being played late game to get that final bit of damage in. 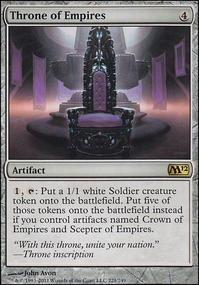 Commander's Sphere is super cheap right now. 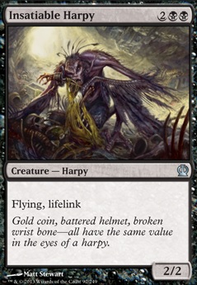 Same with Darksteel Ingot, Leaden Myr, Everflowing Chalice, Astral Cornucopia, Corrupted Grafstone, Guardian Idol, Phyrexian Totem and Worn Powerstone. there are more (My LGS goes by tcg prices so that's what I use). 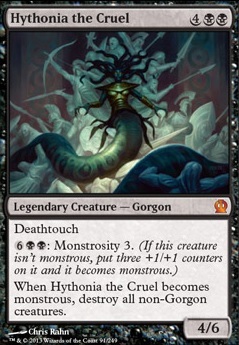 If you wanted to make Hythonia the Cruel deck then maybe add a couple more gorgons. 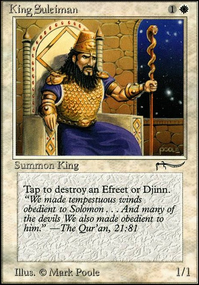 The ramp cards I suggested should be auto-includes once you get your hands on some money. Thanks BelugaWhale217 for the suggestions, but I probably won't use them. 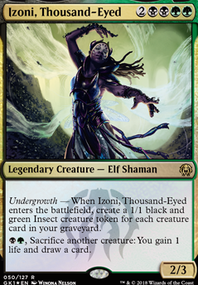 I tried to keep the deck under $30.00 and I just wanted to make a Hythonia the Cruel deck, not necessarily a Demon Tribal deck. The mana rocks you suggested would pump up the price a bit too much, though I will add in Charcoal Diamond. Within those restrictions, do you have any other ideas? Some number of Pulse of Murasa could also be helpful if early game rushes are a problem. Maybe for 1 or 2 between Vessel and Grapple. 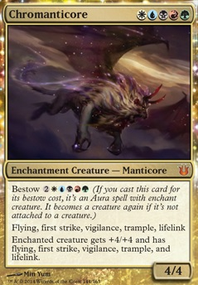 Sideboard should be where enchantment/artifact hate goes (2-3 is a good number, Naturalize is efficient, cheap, and good enough for most situations). 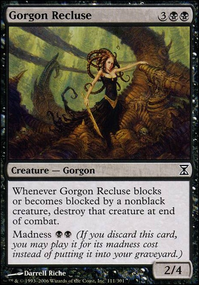 Consider for sideboard a pair of Languish for go-wide strategies, and some exile removal for go-tall hard-to-remove strategies. 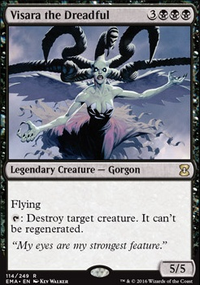 Vraska's Contempt alternatives: I think planeswalkers will be hard for the deck to deal with, unless creatures are chained efficiently, so making sure your removal hits planeswalkers is a good idea. 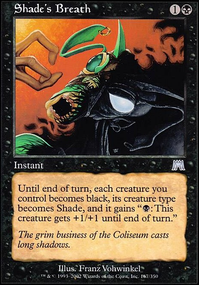 Some alternatives to Doom Blade are: Hero's Downfall, To the Slaughter, Never / Return). He_Who_Hungers on Sisters of stone death my personal deck. Came here mainly to upvote for SoSD. Love the card. 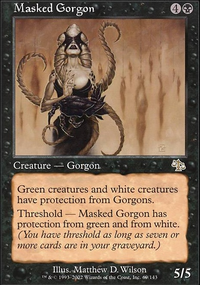 And the gorgon creature type in general. You could consider adding Hythonia the Cruel to play off the Gorgon synergy and possibly get a big swing in with the Sisters.